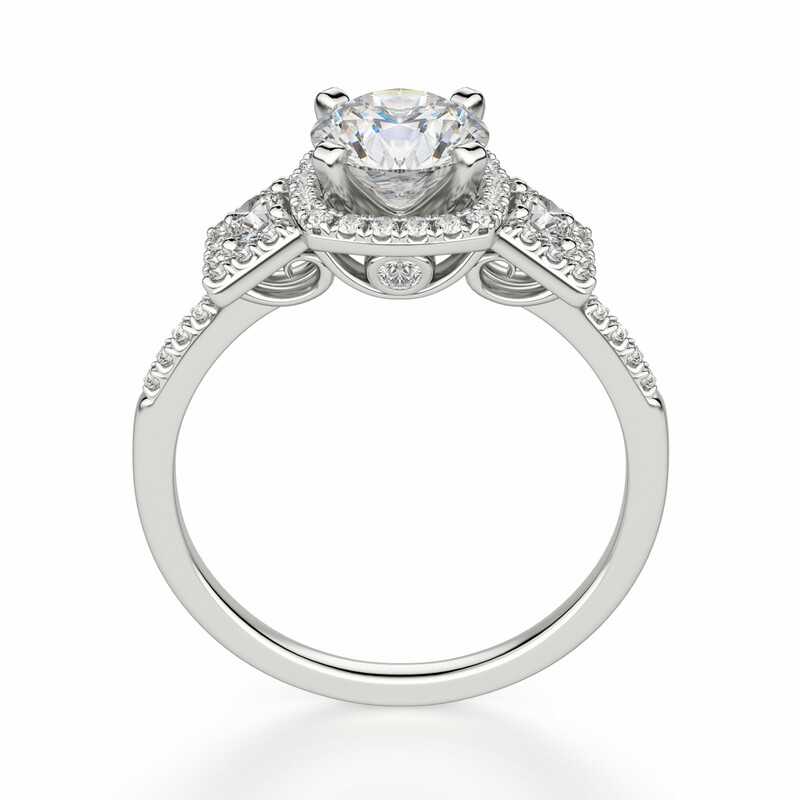 Tabitha Engagement Ring with 1.03 carat Round Center was added to your cart. This stunner features a unique triple halo with a high profile setting to showcase the 1.03 carat Nexus Diamond Alternative in the center. 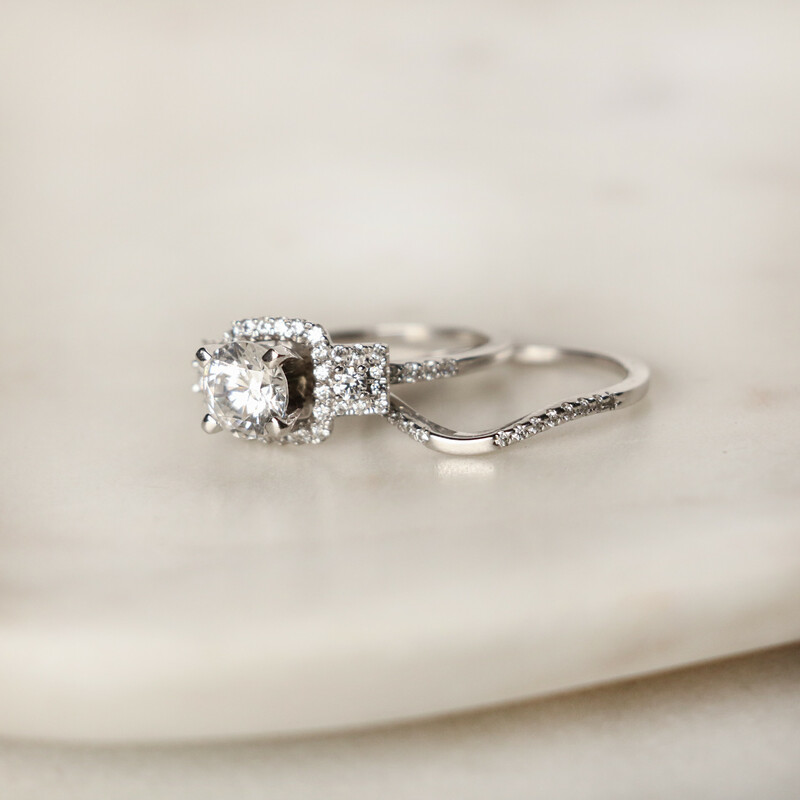 Two accent stones are encased in halos on either side add even more weight to this ring, and the sparkle doesn't stop when it hits the slim band. Even the intricate metalwork in the profile of the setting has a peekaboo style bezel set stone for extra shimmer from all angles. Complete the look with the matching Tabitha band. The lady WANTS a blood-free Halo! After going to numerous places locally, Found the best Halo style rings with Nexus. My GF was even more excited by the lower cost and ethical nature. Tabitha ring hit all of her checklist items for far less than I imagined. Hopefully she'll say yes this December! Ordering the band too as it's an amazing unique style together. If she decides she wants more, I know I'll be back! I’m so conflicted when writing this review...my boyfriend proposed yesterday and we are SO happy words just cannot explain!!! When you’ve been together 7+ years, you can’t keep much from each other...I knew when then ring was coming, but what ring he chose and how he proposed was a complete surprise. Let me start by saying that the ring is stunning. The style is so “me” and I do not have a single negative thing to say about the design! The problem...is that it’s missing a small stone. Although nothing could change the way I felt when he proposed (I’m still on that high!) I’m not gonna lie and tell you that I don’t notice the missing stone every time I look at it. It’s still so beautiful that part of me doesn’t care that a diamond is missing...then I think of the journey to get to this point and I just cannot imagine why they sent me a ring with a missing stone. ??? I think I also need to point out that I have been back and forth many times with customer service. The ship date was pushed back and Jessica was wonderful at communicating to me that the ring did not pass final inspections and had to be remade. The communication was/is NOT the problem...their team was wonderful! But if this is the ring that was remade, how did it PASS inspection, when I can clearly see a stone is missing?? Is this the first ring? Was it even remade? The worst part is that I’m so in love with this ring, and do not want to part with it yet to send back for repair; We have been through SO much to get to this special moment in our lives, and now I have to decide if I want to live with a ring that has a missing stone, which I will always notice....or send it back and wait for who knows how long to get it fixed. Will it take a month? Longer? Our friends and family all can’t wait to celebrate with us...how do I go without my ring now?! I don’t want to have to decide this. 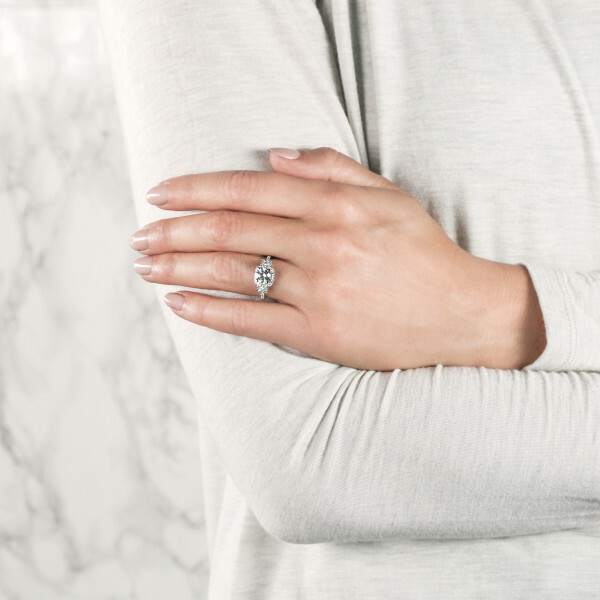 I don’t want to take off my engagement ring right after I was proposed to...and my biggest disappointment is that I have to feel this way at all, when I should still be basking in the excitement of getting engaged and showing the world my gorgeous ring. I truly feel that this ring did not pass final inspections. And if that is the case, why was it shipped before it was finished?! I made it very clear that I did not want a place-holder ring sent, but that I wanted to wait for MY ring to be finished. I thought that meant it would be completely finished, and would pass whatever inspections are necessary and part of the process. I think what needs to happen is a more realistic ship date from the beginning. I can completely understand that things happen and a ring needs to be remade. But after that happens, shouldn’t the final product be up to the standard that is promised? As you can see I am still giving this ring 4 stars. That is because the ring is perfect in every way, except for the missing stone. Customer service would get 5 stars for the way they responded so quickly to all of my questions and shipping delays. I am not the type of person to complain, but a missing stone is a missing stone, no matter how small. I have some engagement events that I will need to keep my ring for, but I will end up sending it back for repair, and I know it will be taken care of. I just wish this wasn't the situation. My fiancé ordered this ring on April 5. Shipping takes a looooong time. It was due to arrive 4/20 but the order remained “processing”. My fiancé called twice and the second time we were told that we would receive the ring 4/24. Unacceptable! Our engagement dinner was 4/21. The customer service rep sent us a ring in a different size (6.25 instead of 6.0) so that we had something. We had the option of sending it back if it was too big. Well, the ring fit perfectly but the stone was cloudy. I have to constantly clean it. Next to a CZ, the CZ has more sparkle. I’m very disappointed. For the price I expected the stone to be a little closer to a diamond sparkle. I want to send it back to be examined but our wedding is in 21 days and I’m afraid I’ll get married without a ring if I send it back. The band is thin but extremely sturdy. It’s a beautiful ring but the he stone makes it look cheap. Could not be more pleased!! I was so in love with this the moment i opened the box. It is so much more beautiful than the picture. I ordered a 4.5 which is perfect but it does slide around on my finger so will get a guard to keep it upright. My only suggestion would be to make the band a little thicker and it might not slide as much. So happy I went with this company because the quality is wonderful!! This ring is beautiful. The lighted box it came in really made it shine. I suggest two matching bands with it! I ended up upgrading after a few years to a different ring but this one has still been my favorite. Absolutely GORGEOUS!! I couldn't be happier with my ring. The center stone is more than stunning and beautifully surrounded by dainty shiny stones. The band is slim but sturdy and perfect for the setting. I've received tons of compliments! No regrets purchasing. Thank You Diamond Nexus for the courteous service and exceptional product. My wife is totally in love with this style! I'm thinking of getting it for her. My bf proposed recently... Both him and I were unsure if it was going to look as good as it looks online. When it arrived he and I were really impressed with the packaging, the box and the way the ring looks. I love it!!!! Perry one of the custumer service experts was very helpfull he waited patiently with me while i waitied for an e transfer to come through so i could afford the tabitha and the he put all my info in for me and processed the transaction. I am in love with this ring! Everywhere I go someone compliments me on how pretty it is. 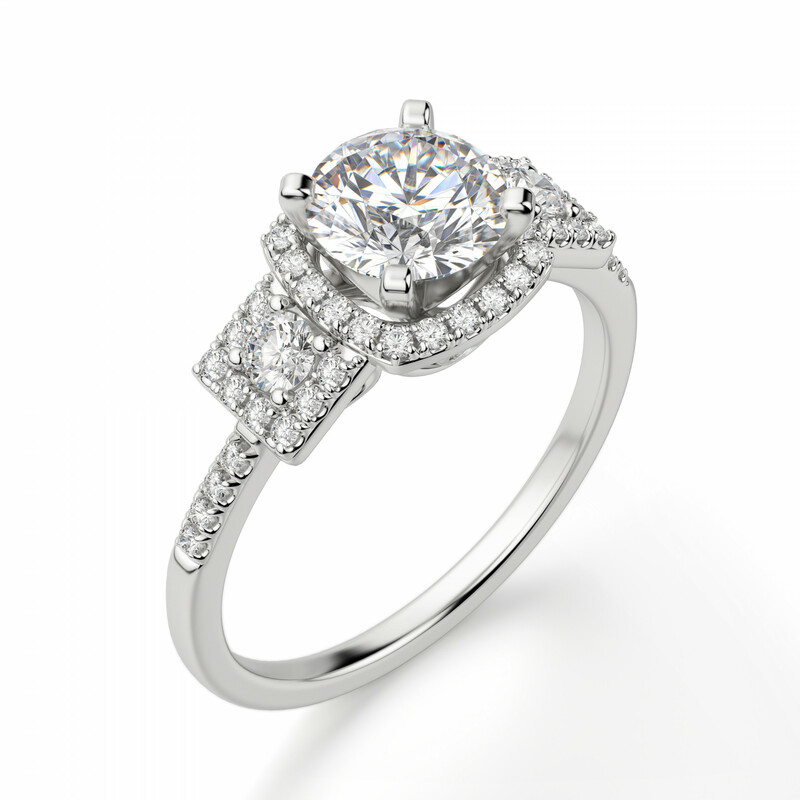 The center stone sits just right to catch the light and sparkle and the halo accents only add to that. Ring is beautiful, but takes ridiculously too long for resizing. The ring is beautiful for the one day I had it. It took almost 2 weeks for it to be delivered according to my fiance. The day he proposed, it was too small so we sent it in the following day to get it resized. I shipped it on a Monday and it arrived at their store on Thursday at noon just as expected, but then we get an email saying they are keeping the ring until the following Friday to get it resized. Which means I wouldn't get the ring back until 3 weeks after I sent it in. If I have any problems with this ring I will not be sending it back when I can have it fixed and resized in 2 days instead of 3 weeks. I haven't been able to enjoy showing it off. I'm not sure why it takes over a week to have it resized. Beautiful setting but the band is way too thin. I am beyond in love with the look of my ring. The only problem is the band is sooo incredibly thin on the bottom. It goes from thin to almost paper thin on the bottom I'm scared it could snap. 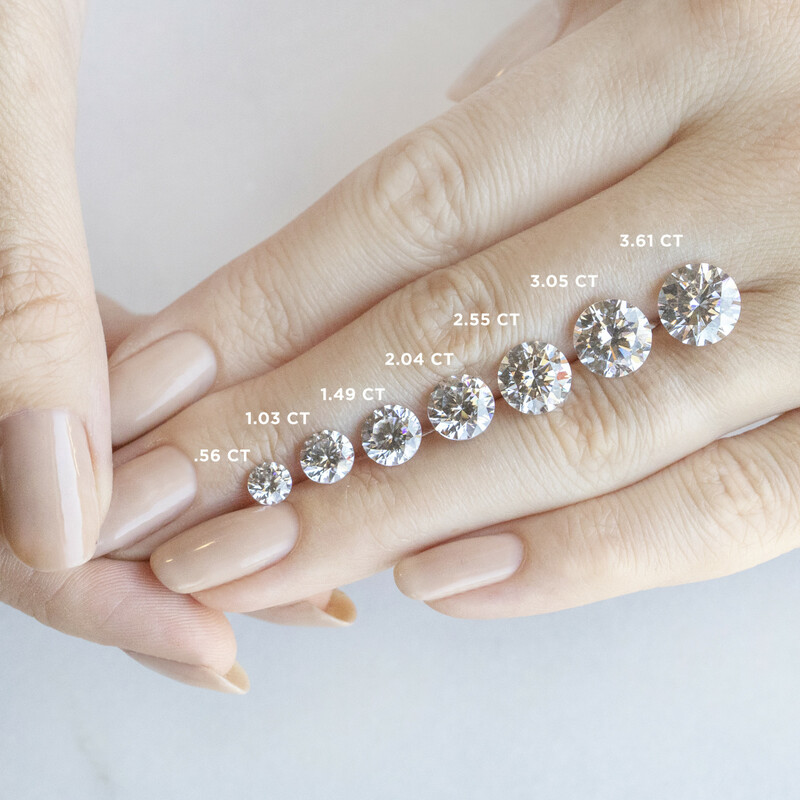 I'm hoping when we buy the wedding band it won't be as deceiving with the width as the pictures make it look. My Fiance loved this Ring! It came on expected date, and customer service was amazing! Beautiful Ring, my fiance adores her ring! I love my ring. i LOVE LOVE LOVE that it is guaranteed conflict free and I am proud to wear it. My fiance did a great job :) The center stone (to me) is much bigger than it appears online...still love it! To say this ring is stunning is an understatement! I was absolutely blown away when my fiance gave me the ring. 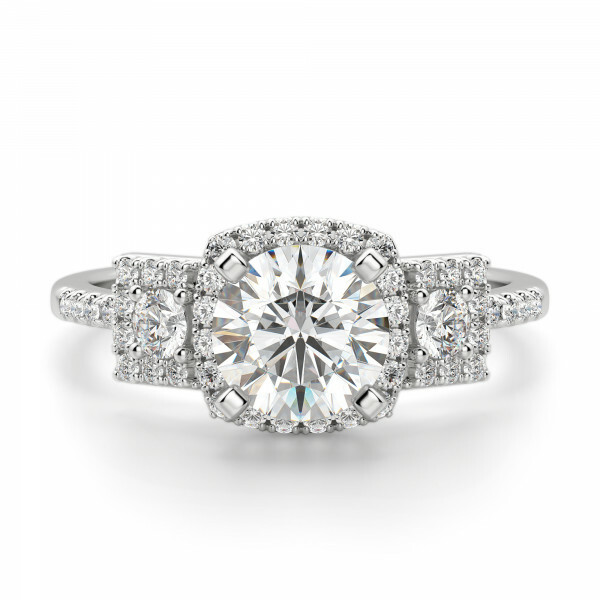 The size of the center stone with the halo around it is perfect. It's feminine, elegant, has a vintage feel, and yet has a modern twist. The best part is, the price can't be beat, especially for this fantastic quality, and above all, it's an eco-friendly ring. Thank you, Diamond Nexus, for creating your amazing, affordable products and for making me the happiest bride-to-be in the world! My fiance proposed 3 weeks ago...it was so cute. I fell in love with the ring at first glance...it's perfect. It sparkles! Fits perfectly...I have tiny fingers...so the size 5 is just right. I've received numerous compliments...even from strangers. Better looking in person!!!! More than pleased with this ring! I am thrilled with this ring. It's beautiful and eye catching. I've had numerous compliments on it from others. The design is unique with the addition of the two smaller diamond on each side of the center diamond. It looks even better in real life than it does in the pictures. I received the item today. It is STUNNING!! I read other review said that since the band is thin, order a little smaller than your true size. I order a quarter smaller, and it fits really well!! Oh and the 2 side stones are a lot smaller than the photo. All in all, Iove my new ring!! Thank you Diamond Nexus. Id like to start off by saying the picture and video does it no justice the ring is twice as beautiful in person. It shines non stop and catches everyones attention.my fiancè purchased this ring for me when we got engaged and I fell in love the moment I saw it. 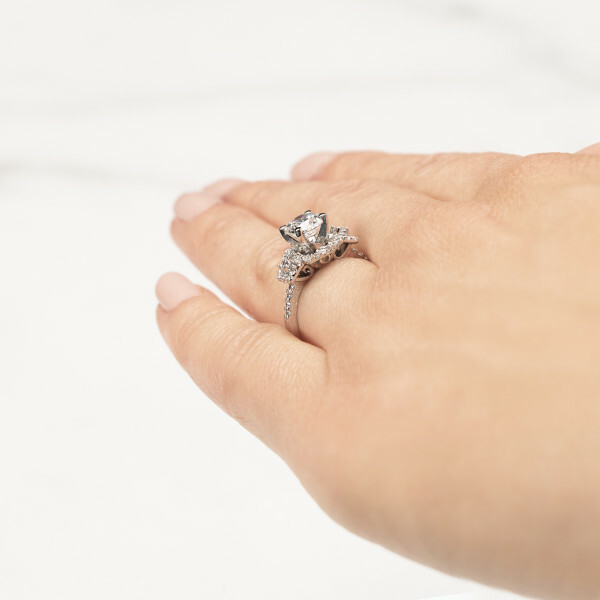 The only con I can think of is that since the ring is thin it dances around your finger and slips off easily so I suggest getting half a size smaller. But besides that I have no complaints. Even when I called to get my ring resized the customer service was very nice and helpful. Will definatly be purchasing from here again. My wedding date was 5/11/2013...I've worn my ring for over a month now... & it's super super gorgeous. I was so indecisive when it came to picking my ring, but I'm so happy that I chose this one. The diamond size it perfect! I get compliments all the time on my ring... People think we paid a ton! :-) I've been through the rain, the shower, the dishes... doing hair & everything else w/t my ring... and it's still shining like Day 1. I love the way it sits up... I love the detail on it. The setting is amazing. I told my hubby Get this ring folks, you wont regret it! like I have a one a kind ring. I know my friends and coworkers won't be able to take their eyes off of it!!!!! we went out and I tried on many rings in the jewelry stores and even though I tried on many beautiful rings, no ring compared to this one. I am a size 6, and do not have delicate fingers. this ring made my hand look more feminine due to its thin band (which I love) and the way the centre stone is flanked on either side with detailing. It is a beautiful ring and the photos really do not do it justice. I love the side vintage detailing and the 3D look. My only complaint, is that I had been fitted for a size 6.25 previously with a real ring sizer, so I ordered a 6.25. I think because of the thin band, you would want to go down a quarter of a size (a size 6 would have been perfect). I may have to send it back to be re-sized, but I don't want to be without it! Overall....you will not be disappointed with this ring if you are looking for a feminine ring that is not gaudy and over the top. I think it is the perfect ring. I love it...I can't stop looking @ it! The pictures do not do this ring justice. It is so sparkly and absolutely gorgeous!! My now fiancee asked me to marry him last night on new years eve and I was so surprised. When I saw my ring for the first time I cried I was so happy! Thank you Diamond Nexus for making my dreams come true! This ring is far more beautiful in person! I knew the bands were thin but they were a bit thinner then I thought it would be, it's still BEAUTIFUL though. I would recommend getting two of the matching bands instead of just one and having them all soldered together. I LOVE my ring and the presentation was breathtaking! Customer service was an A+++, Tracie Grube and Perry Weber you guys were hands down amazing and made the process that much better. Would reccomend this ring and DNL anyday!